On a recent trip I carried food harvested from False Bluff in an old bag I've been using for years. 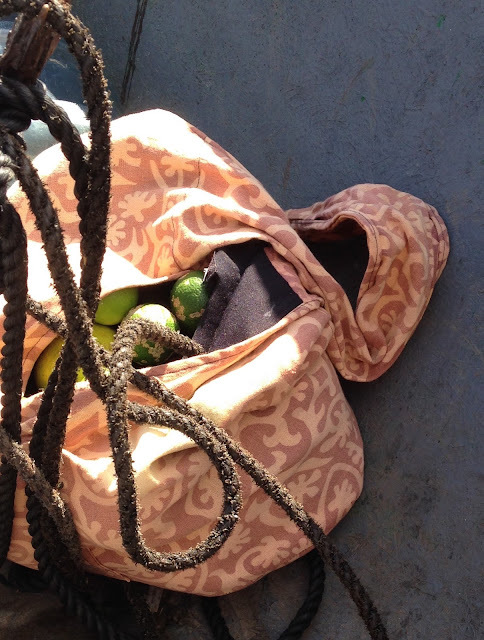 The bag sat, pretty well loaded, in the front of the boat heading to Bluefields. Every piece of food had been harvested and in the bag just before heading toward town. Two papaya, scored and ready to "peel and eat;" two types of limes, smooth and rough (my favorite); and some red bananas.